Excellent selection of leather split reins for sale in a variety of widths, thicknesses, and lengths. Split reins are a type of rein used for riding a horse: They are two separate, individual reins that are used together, as opposed to a one-piece rein that is sometimes called a "roping rein" (for more information please see "What Are Split Reins," below). Many riders prefer leather split reins (as opposed to synthetic materials) for the "feel" they create between the horse and rider. They are often the preferred choice of working cowboys and cowgirls. Below are leather split reins for sale on eBay. Please scroll down toward the bottom of the page for good things to know before buying split reins. 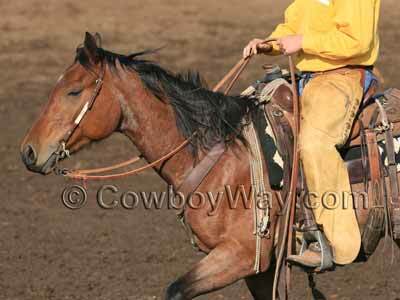 Below: Leather split reins being used by a working cowboy. Are the leather split reins new or used? Most of the ones we've seen on eBay are new, but you will occasionally come across a used pair. How long are the reins? The length of split reins varies, so make sure you don't get a set shorter or longer than you wanted. How wide are the reins, and how thick? How do the reins attach to the bit? Do they tie on with water loops, use Chicago screws, come with snaps, etc.? Some people prefer to tie their reins to the bit (either directly or with water loops) because they like the feel this gives them when they communicate with a horse. Some folks like the looks of Chicago screws, while still others like snaps so they can quickly switch the reins from one bridle to another. If the leather split reins come with snaps, do you like the type of snaps? Are they too big or too small for your preferences? If necessary, can young hands or arthritic fingers work them easily? What color are they? Leather can come in a variety of dark or light oils, and, while it's less common, some leather split reins are even dyed to a certain color. What will the shipping charges on the reins be? On eBay the shipping charges are often free, but not always. 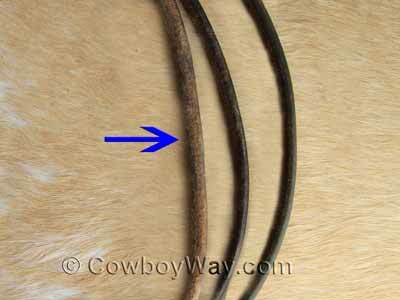 What Are Leather Split Reins? Split reins are a piece of equipment used for communicating with a horse while it is being ridden. 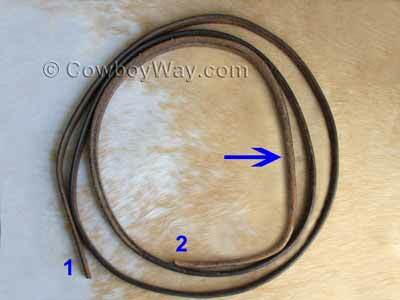 Leather split reins are split reins made of leather as opposed to some other material such as nylon or cotton. Split reins are two separate, individual reins that are used together, with one rein on each side of the horse's neck. Each rein attaches to the bridle and extends from the bridle to the rider's hands to help communicate such things to the horse as when to stop, turn, speed up, slow down, and more. Split reins can be contrasted to a one-piece that extends from one side of the bridle, over the horse's neck, and down to the other side of the bridle. Below: Split reins. When a rider dismounts a horse and intentionally leaves one split rein on the ground it is often a cue for the horse to "ground tie," or to stay there until the rider returns. Which type of reins a rider uses, split reins or one rein, is a matter of personal preference. Split reins are commonly seen in the Western riding disciplines, although some Western riders might use one rein. 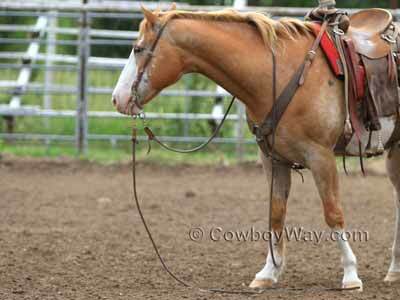 Split reins are heavily preferred by most working cowboys and cowgirls. Weighted leather split reins have extra weight in them, either toward the bit end, the back end, or both. The weight, regardless of which (or both) ends it's located, is intended to help that end of the reins hang more quietly. Not all split reins are weighted: It's a matter of personal preference. In the photo below of a single split rein, the #1 shows the bit end of the rein. The #2 is the the opposite end of the rein, the part that hangs down the side of the horse. If you look above the #2 where the arrow is pointing, you will see that the rein is cut thicker for several inches to give this end added weight. Whether or not split reins are weighted (at either end) is a matter of personal preference. This is a close-up from the photo above, showing the part of the rein that is cut thicker to give it added weight. If you prefer weighted leather split reins to ones that aren't weighted, be sure to read the product description to find out, if, and where, the reins are weighted.